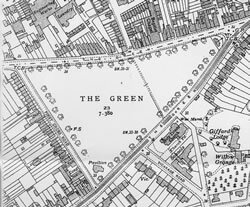 Twickenham Green is not an ancient village green. It is the surviving fragment of the eastern section of Hounslow Heath, previously referred to as Twickenham Common or Little Common. Contained on the north side by the road out to Hanworth and Sunbury, on the south side by the road to Hampton, its triangular shape was completed by the road later named First Cross Road, to the west. The apex of the triangle may have been marked by a gate to the town and there was possibly a pest house in the area. (Pest house: a place of isolation for the holding of victims of infectious diseases such as smallpox or the plague, particularly during epidemics) In 1894 it was marked by a water pump given for the use of the poor by Countess Waldegrave. The pump may also have been used to draw water for the horse trough nearby. As late as the nineteen-sixties the Salvation Army Band played here on Sunday mornings. From time to time a maypole was raised in the centre. In 1818, the year of the Enclosure Award, First Cross Road was called Workhouse Road and the land facing it Workhouse Allotment. This land, just over 4 acres, occupied about half the Green as it is today. 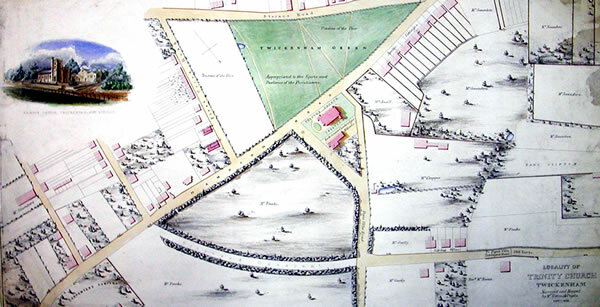 "...for the time being and for ever on trust all that piece or parcel of Freehold Land No 119 on plan annexed containing four acres one rood and ten perches situate on Little Common bounded on the North by the Hanworth and Twickenham Road on the South by the Hampton Road and on the West by the Workhouse allotment which said allotment is to be fenced..."
First Cross Road contains a few early 19th century artisans cottages, but apart from these and the Workhouse, most of the buildings now surrounding The Green were built later in the century. Thomas Stirling's property stretching along May Road (then known as Stirling's Road) may be an earlier survival. The Workhouse, dating from 1725 was demolished in about 1845. Property ownership on this side of The Green was marked by comparatively narrow and deep frontages which related to the mainly humble collection of dwellings along Colne Road to the north. The junction of May Road and Colne Road marks the site of the Watchhouse ('Cage') and stocks, moved there in 1765 and still in position in 1840. By contrast, to the south the properties were grand: a flavour of these is obtained from the view of Gifford Lodge and its neighbour, Twickenham Grange, engraved by Thomas Boydell in 1753. 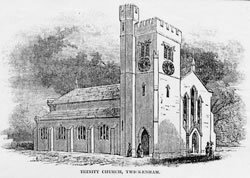 Holy Trinity Church followed this tradition when it was built in 1841. By 1845 a row of 15 paired dwellings had been built and named Apsley Cottages, later Villas. In 1906 they were named 1-29 The Green, even numbers being on the north side. The Twickenham Cricket Club was formed in 1833 but it did not move to The Green until later, probably following the demolition of the Workhouse, when the allotments were no longer needed. It was favoured with visits by Dr W G Grace to play in charity matches. A map drawn by the pupils of Mr Gittins School in 1850 shows the allotment land still reserved but the remainder described as "Appropriated to the Sports and Pastimes of the Parishioners".